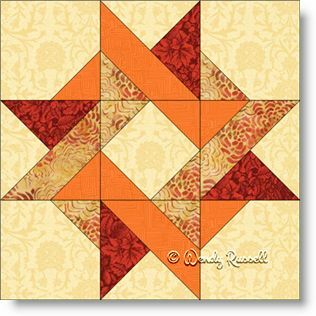 The Entwined Star quilt block is a standard nine patch featuring half square triangles and quarter square triangles. The centre patch is made with a square in a square unit. All of these are common patches. Just to mix it up a little, I have given instructions for the "sew and flip" method of making the small corner triangles in the majority of the patches. These are created with small squares which are sewn down and then flipped back to form the triangle in the corner -- hence the technique name. The two sample quilts illustrated are both designed using on point settings -- but give two totally different results.